Purchase Order sheet is simply known as PO sheet. Purchase order sheet of garments manufacturing (PO sheet) is commonly used important document for Garments Manufacturing. Basically purchase order sheet contains the information of confirmation of buyer order. To clarify some important manufacturing and technical issues buyer has to provide PO Sheet. In a PO sheet there may have information of product style, PO number, fabric cost, trims cost, garments unit cost, order quantity, shipment date, shipment destination and many others important things. 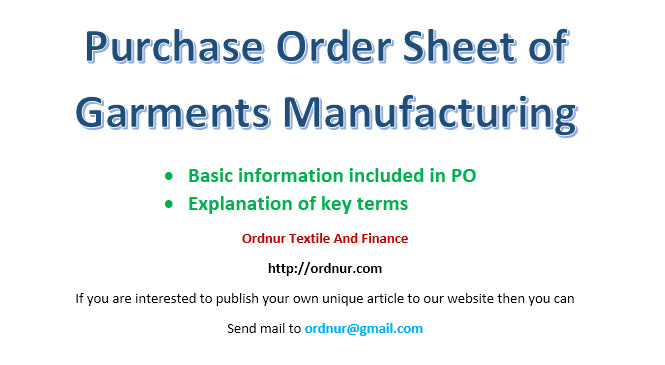 Purchase Order (PO) sheet is necessary for every department of Apparel Industry. Without PO sheet you will not be able to know about your shipment date, shipping destination, over ship or under ship tolerance, payment term. That’s why this document (PO sheet) is such an important. Considering the importance of this document I have made a list of basic information which may include in PO Sheet. PO Number: PO number is unique purchase order number which is fixed by buyer. Style: As per garments category or Color buyer separated by different style name. Season: Buyer divide a year in 3 or 4 or more seasons as per overseas weather and their consumer demand. Unit Cost: Unit cost mean cost of single garments. It can be FOB, Cnf or C.I.F. Goods Description: Description about goods which can be long or short. Top or Bottom wear. Tagged Explanation of key terms of Purchase Order, Information Include in Purchase Order (PO), PO Sheet, purchase order sheet, purchase order sheet in garments, Purchase Order Sheet of Garments Manufacturing. May Allah bless you too.